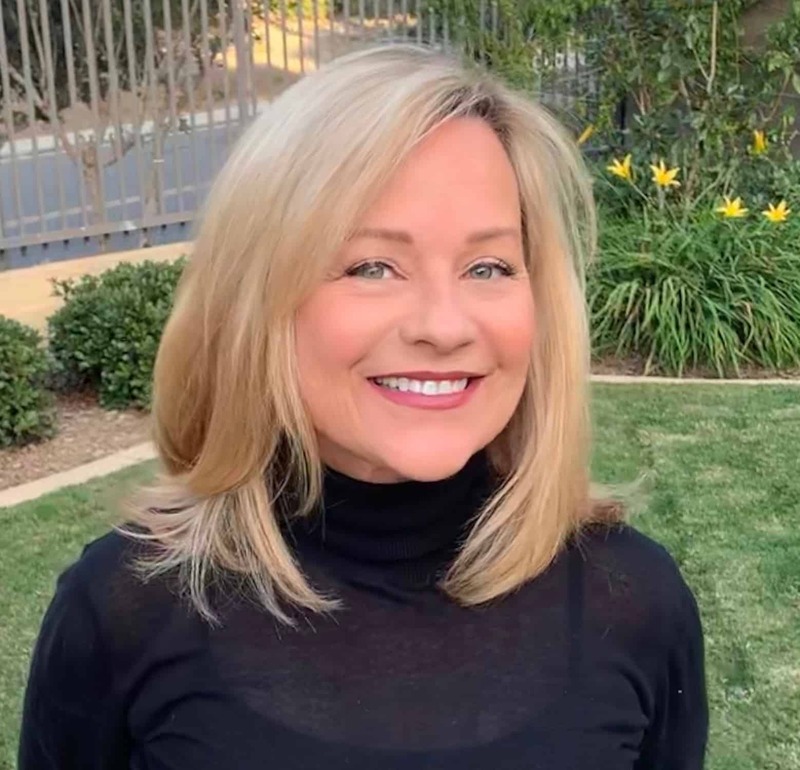 Carolyn is a high school math teacher (I’m so impressed) and likes to take on projects herself. 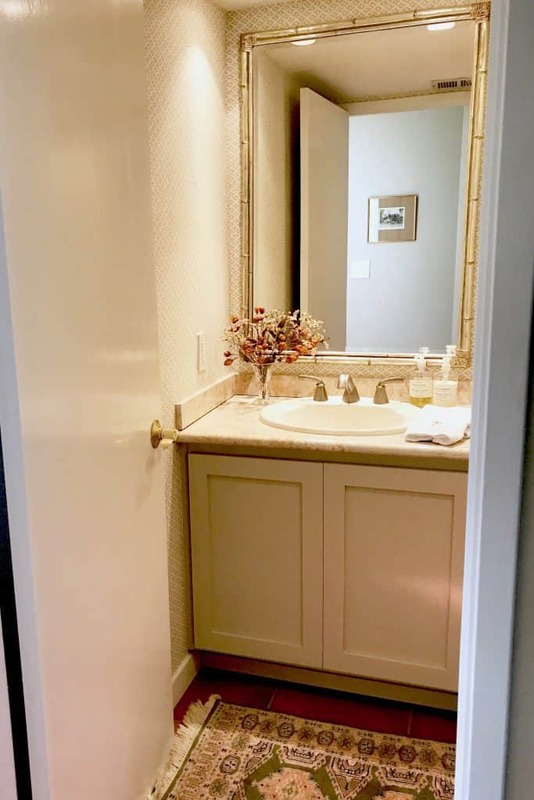 She had a little powder room underneath her stairs that she wanted to give a new look without breaking the bank. 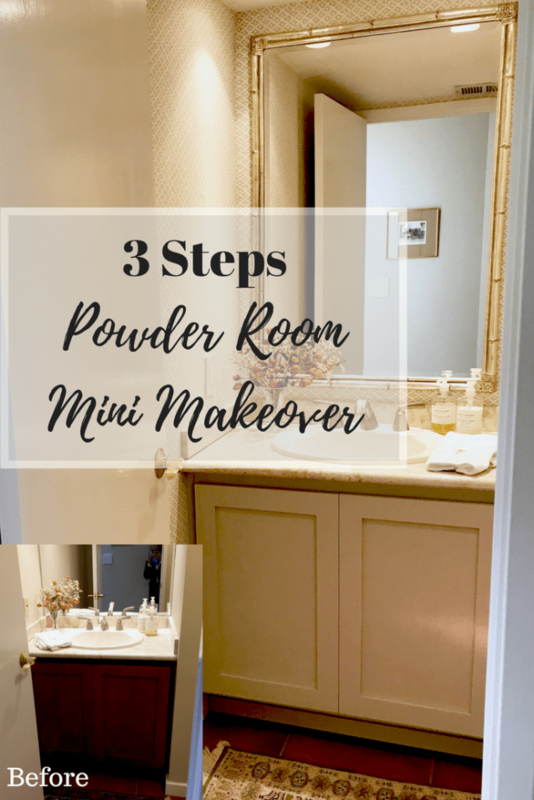 Here’s how we achieved an affordable powder room makeover. 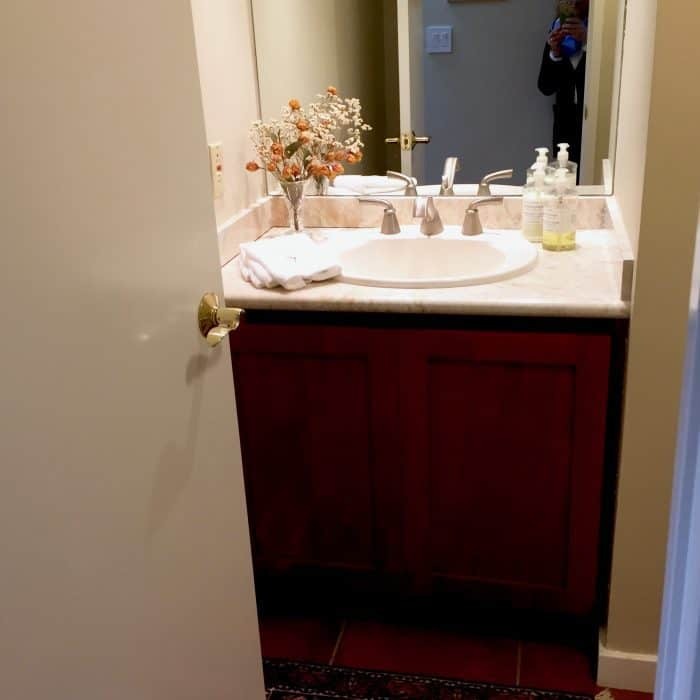 We kept the vanity and plumbing (affordable) but painted the cabinet a color that looks good with the existing stone: Benjamin Moore Revere Pewter. 2. Another affordable powder room makeover tip: upgrade the mirror. 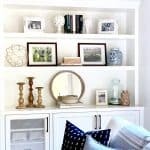 The builder basic mirror was removed and replaced with this Silver Bamboo Mirror from Pottery Barn (on sale now). 3. I showed Carolyn several wallpapers and she has expensive tastes. She chose Galbraith & Paul’s Lattice pattern in the color Stone. BUT, she and her cousin installed it themselves (God bless them) saving some $$$. And the wallpaper makes the room! And last week, while I was there to go over some other things, we hung some cute art over the toilet that Carolyn bought at her local Orchard Nursery Shop. Carolyn loves an English countryside look. 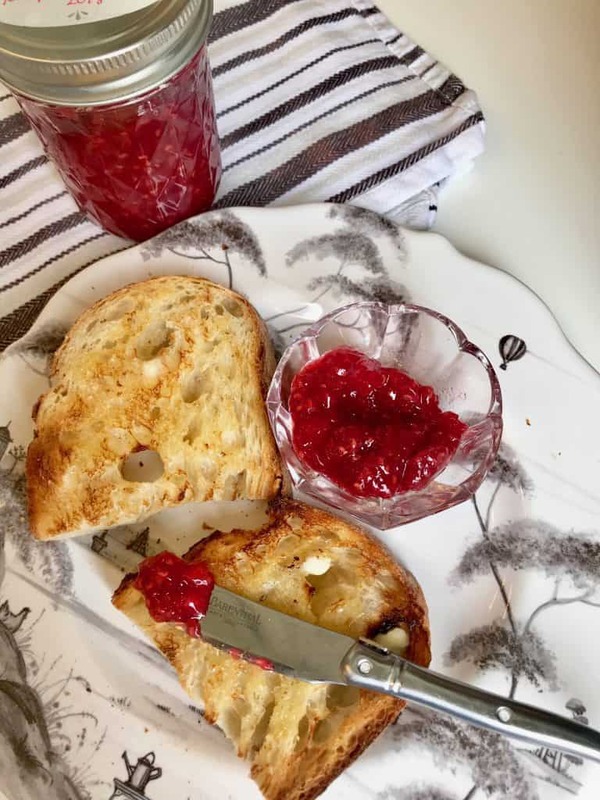 She also makes great, home-made jam and gave me a jar to take home 🙂 I just served some to our daughter and her friend, Danielle for breakfast. They are here for a party. Alie brought our dog, Chief back to us but after his extended visit with her in L.A. he only has eyes for her now! 🙁 I will win him back! If you haven’t already, I would love for you to subscribe to my posts by email. Previous Post: « Modern Boho Style Apartment in L.A. This has come at a perfect time. 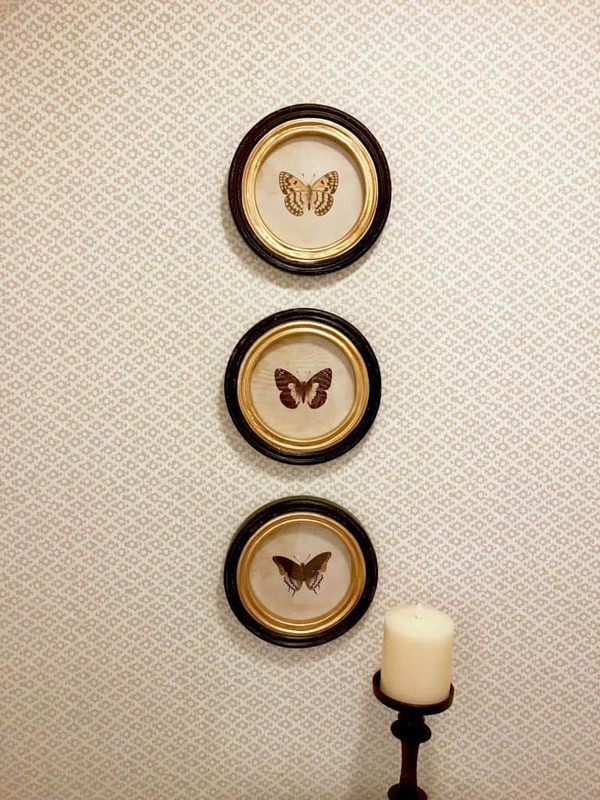 Don’t tell my husband, but I’m in planning stages of our powder room re-do! This just validates I need to lighten it up! I know wallpaper is all the rage, but I really just want to paint it. It has white headboard wainscoting on all for walls, can you suggest a new paint color that will look up to date? Send me a couple photos, Gail! We are going to have a project design: favorite interior paint colors…perhaps we can use yours as an example.?? 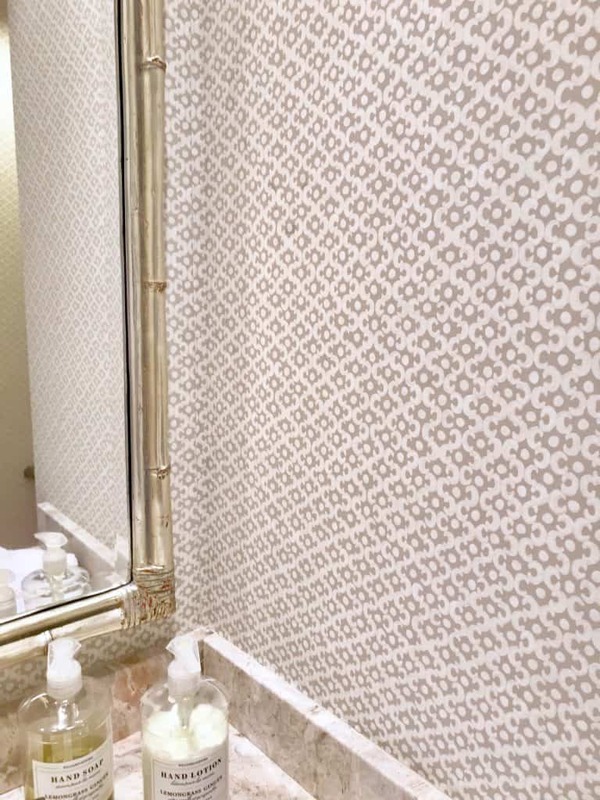 Good call on the wallpaper–it dresses up the room so much. So does the mirror. Bravo for taking something that was OK (because honestly the Before had nothing truly awful about it) and raising it to to a little gem. It really makes me think about corners of my home that could easily go from bland to beautiful. Thanks, Caroline says she gets lots of compliments on it now…whereas before no one mentioned it. 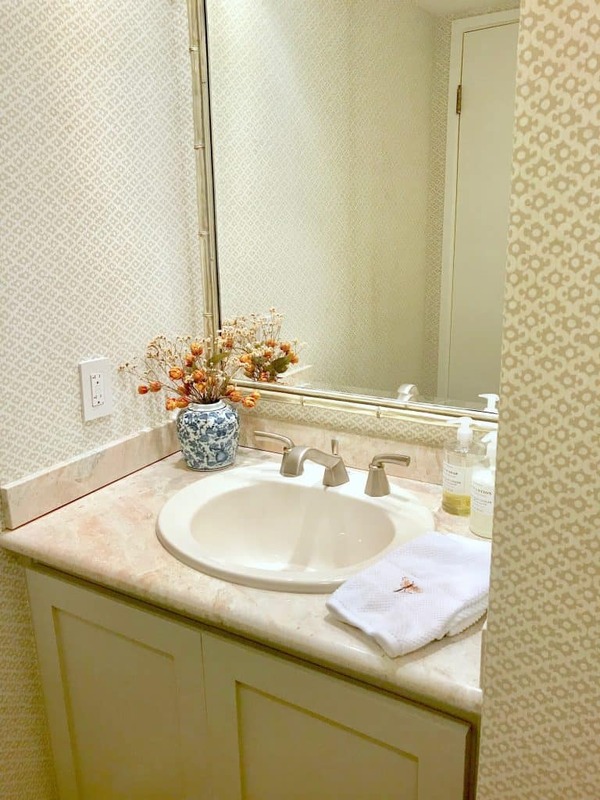 Love the wallpaper and mirror and the fact that the makeover was a practical, affordable yet beautiful result. Glad Chief has returned to his Rightful One and hoping he will soon get over his turn coat ways! Men can be so fickle at times! Love the rug, bet it adds the right pop of color. Loving the elegant, serene feel now. I believe Sherwin Williams is the company for Revere Pewter. 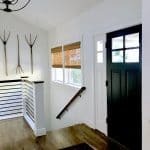 Great color… used it on all my woodwork. Hi Barbara, it’s definitely Benjamin Moore Revere Pewter (I’ve used it a lot). But perhaps Sherwin Williams has one similar. 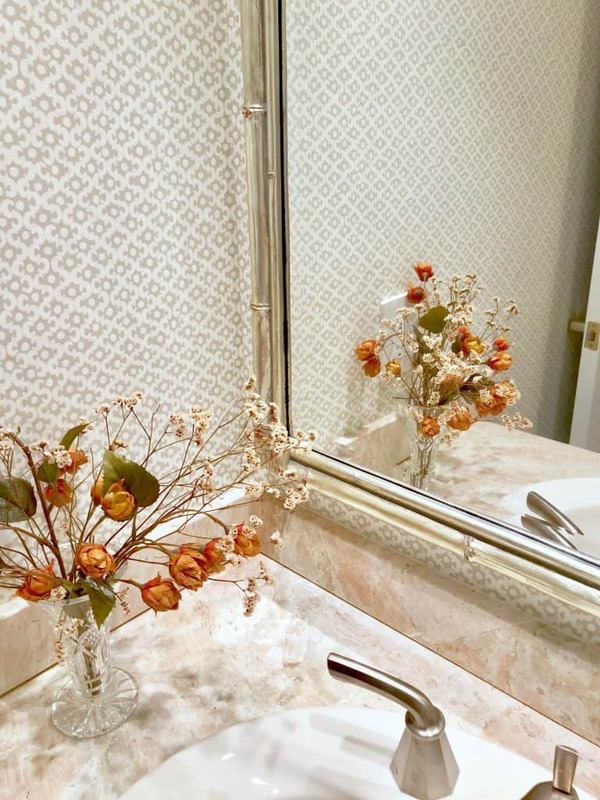 These are my favorite types of updates, and this one is particularly pretty – the wallpaper makes the whole thing look important, and the mirror adds a big hit of luxury. A great reminder that not everything needs to change in order for the space to improve exponentially – it’s so much more than the sum of its parts.